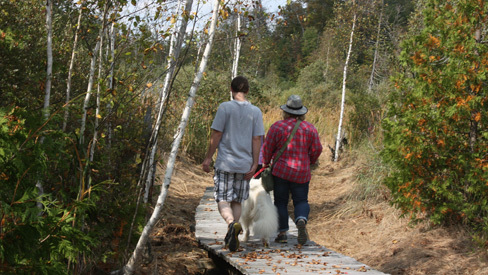 The Great Pyrenees Club of Southern Ontario ( GPCSO ) is host to, or participates in, many events throughout the year. Both social and competitive, these events allow members to catch up on the latest news and to show their dogs to win those most sought after points towards Championship status. But it’s not all formal competition… There are relaxing times as well with informal get-togethers for the Pyrs and their owners. You don't have to be involved in showing your dog to enjoy membership in GPCSO. Please join the fun! Everyone welcome. The date has been set, rain or shine, for May 26, 2019. 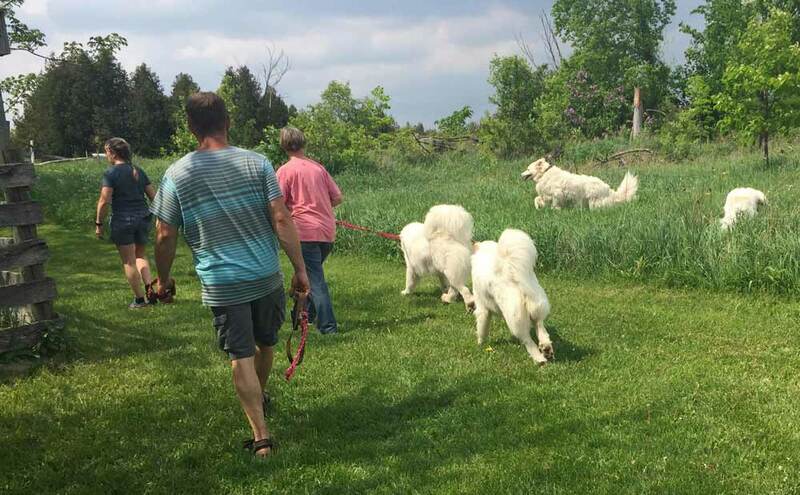 Date and time: May 26, 2019, 12:00 p.m. to 4:00 p.m.
Dr. Carol Graham’s farm is built for the big white fluffies. There are large fenced areas in which your well-behaved pup can run and play. If your dogs need time out, there are some big pens in which they can rest. There is also an outbuilding which will provide protection from the elements if required. 12:00 p.m. The main event opens. 1:00 p.m. Potluck Lunch. Bring your favourite dish to share. Silent Auction: Includes a woven scarf made of 50% Pyr coat. to sell on the baked goods table. Buy some, too. liver, heart, and chicken feet. Paws up on an object. Loose leash walking 30 ft.
Mark the date in your calendars. We hope to see you there! The Walk through beautiful fields and forest. This section provides information on GPCSO Club events as well as other events in the area served by the club that may be of interest to Club members. This is an added service for our Club members and our visitors. We'd be amazed if you didn't, so we've made staying informed about GPCSO events as easy as pie! We will email you whenever we have an event to announce. And we will send you reminders too. Each Announcement will have all of the details and latest breaking news, so you will be kept completely up to date. But of course we value your privacy, so we need you to do one simple thing... subscribe to our GPCSO Events Announcements. It's easy to do and we promise not to share your address with anyone, plus... if you no longer want to receive our announcements, you can unsubscribe at anytime with the simple click of a button. Couldn't be simpler now, could it? I promise to use it only to send you GPCSO-Event-Announcements. Still not convinced about your need to stay informed? Don't miss this opportunity to stay on top of what's happening with at GPCSO. Want to know about planned events and late breaking news as quickly as possible? Subscribe to the GPSCO Events Announcements and we will deliver Club Event Announcements right to your mail box. Just use the form above to subscribe. We all know that wherever you go, with so many beautiful Great Pyrs around, cameras are never far away. So here’s where you will find Great Pyrenees photos from past events in 2006 and 2007. 2008 was a great year for the club. To see some of our activities, go here. Want to see why 2009 was such a fantastic year? Here's your link to our 2009 events. GPCSO was very busy with its 2010 events. Why not take a look here. GPCSO was very busy with its 2011 events. Why not take a look here. GPCSO was very busy with its 2012 events. Why not take a look here. Check out the 2013 events here. Check out the 2014 events here. No matter what the event, people meeting a Great Pyr for the first time always ask questions. Do you know what the most frequently asked questions are? We solve that mystery here. The benefits of GPCSO Membership are just a click away.